Integrate evidence based treatment skills, new wave therapies and experiential learning for personal growth. We have short trainings, workshops and master classes. There is also one special l4 day course, The Master Practitioner Programme in Eating Disorders & Obesity. This unique, inspirational programme is valuable for anyone who encounters eating disorders in their work and attracts people from all over the world. On completion of the foundation course Excellence In Practitioner Skills For Eating Disorders you will be awarded a ‘Diploma In Eating Disorders’. 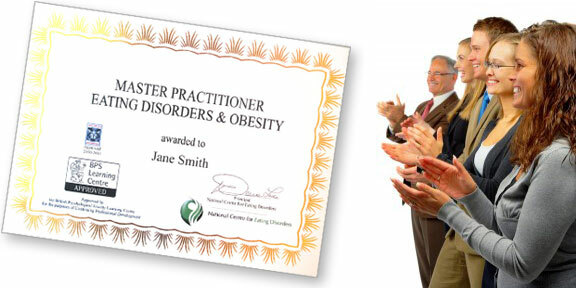 The award of Master Practitioner In Eating Disorders & Obesity certification by completing all 3 training courses below. The courses above have been Approved by the BPS Learning Centre as suitable CPD for Graduate and Chartered Psychologists. The BACP recognises these courses as suitable CPD for counsellors and counsellors in training. CPD points are awarded subject to peer approval by the Royal College of Psychiatrists for the Eating Disorders and Obesity courses.